Welcome to the Lions Soccer Club Home Page! Founded in 1980, the Lions Soccer Club has evolved over the past 20 years to become a consistent force in men’s amateur soccer, competing in three divisions of the CVSA, fielding as many as four teams in the annual Low Country Soccer Festival in Charleston, SC, participating in various indoor and co-ed leagues in the Fall and Winter, and entering regional tournaments throughout the year, including the William and Mary Seven-a-Side, Va. Beach Neptune Tournament, and the MDCVSA State/Challenge/Veterans Cup. Within the CVSA, the Lions Soccer Club is made up of the Lions FC and Lions Express (Premier Division), Lions United (First Division), and Lions Masters (Masters Division). Of course, as a soccer club, our members are expected to indulge in a few social functions throughout the year, including our Annual FallFest and SpringFest cookouts at Bryan Park. 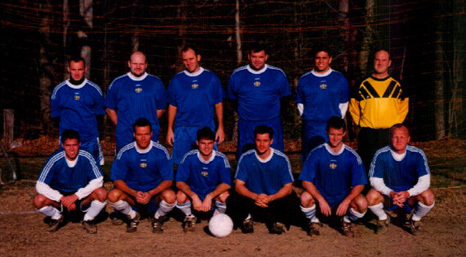 Year 2000 was especially noteworthy as we not only celebrated our 20th consecutive year as a continuing soccer club in Richmond, but we also increased our membership from three to four teams within the CVSA. Practices are usually held once a week at night, weather permitting. Also, congratulations are in order for both the Lions FC and Lions Express for winning the 2003 CVSA Cup and Copa Bruce Championships, respecitvely, for the first time in Lions history (see Recent Events / Results). Way to go guys! Intersted in joining the Lions Soccer Club? Contact one of the Officers. 2005: Congratulations to the Lions FC for winning the MDCVSA State Cup! For complete tournament results, visit the MDCVSA State Cup web page. Spring 2005: Congratulations to the Lions Masters for winning the CVSA Masters Division, edging out the undefeated Rat Masters in the final match of the season by a score of 2-0, to finish 8-0-1. 2005 Seaside Adult Soccer Classic, Wilmington, NC (Feb 2005): Congratulations to the Lions Masters for winning the 40+ Division! For more info visit the CVSA News web page. Fall 2004: Congratulations to the Lions FC for winning the CVSA Premier Division! 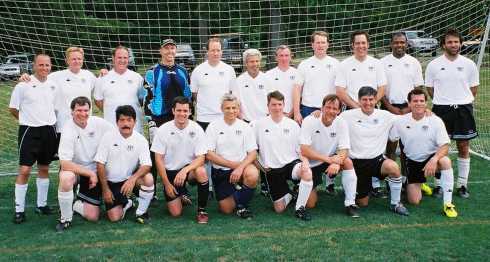 2004 Neptune Soccer Classic (Aug 2004): Congratulations to the Lions Masters for winning the 40+ Division! For more info visit the CVSA News web page. 2003 CVSA Cup/Copa Bruce: Congratulations to the Lions FC and Lions Express for winning both the 2003 CVSA Cup and Copa Bruce Championships! For complete tournament results, visit the CVSA Cup web page. Fall 2002: Congratulations to the Lions FC and Lions Express for winning their respective Premier and Division One Chamionships for the first time in Lions History! 2002 CVSA Cup/Copa Bruce: Congratulations to the Lions Express for winning the Copa Bruce with a 3-0 victory over the Fan Rats at the Sportsbackers Stadium! 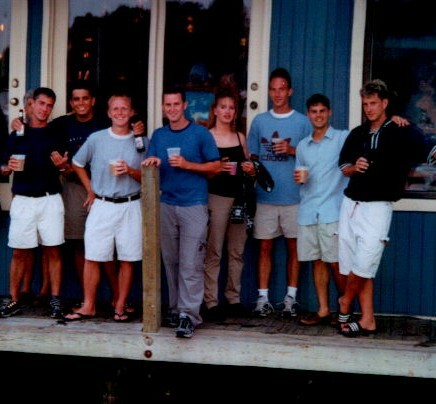 2001 Neptune Tournament (Aug 2001): Once again, the Lions traveled to VA. Beach for the annual Neptune Soccer Classic, this year fielding 2 teams. While the Lions Masters competed quite well in the over-40 division, making it in to the finals...the Lions Express had a different result. After a reshuffling of the roster at the 11th hour, a number of the Lions FC boys joined to give the Express squad a "stacked" team. After dismantling the first team 7-0, Lions Express went up 2-0 in the first half of the second game. At half time the boys started looking ahead and making plans for the night. In the spirit of letting everybody play, we pulled our goalie and rested our "ringers" only to end up losing 3-2 after an own-goal. Even after the crushing blow and the tag line of "the most under-achieving team in Neptune Soccer History" it only gave the team more reasons to enjoy the VA. Beach night life, and to rally for another decisive win on Sunday. 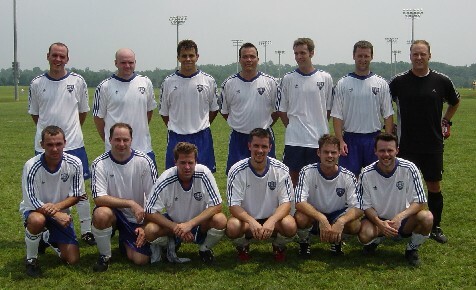 2001 MDCVSA State / Challenge Cup Tournament (June 2001): Lions FC finished 3rd in the State Cup with a 4-1 victory over Dublin FC. Bret Myers was the overall leading scorer with 5 goals in the tournament. Lions Masters finished 6th overall in the Challenge Cup. For complete tournament results, visit the MDCVSA State & Challenge Cup website. 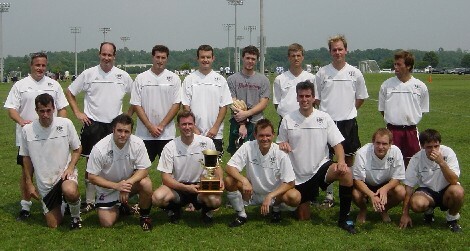 2001 CVSA Cup/Copa Bruce: Lions FC defeated Blackwatch 4-0 in the final CVSA Cup match to regain possession of the cherished cup. The crowning glory was their semifinal overtime win over last year's champions, Dublin FC. Lions United lost in the semifinals of the Copa Bruce to the Tyrants, the eventual tournament winners. Spring 2001: Lions FC clinched the Premier division with a 4-1 win over 2nd place Deutscher Sportclub in the last game of the season. In the first division, Lions Express and United bounced back after last season's restructuring to finish 4th and 6th, respectively, while the Masters maintained their streak at 3rd place in the second division. West Point Indoor Tournament (Dec. 16, 2000): The Lions triumphed once again in the 10th annual Zico's Invitational Indoor Tournament at West Point High, with a mixture of players from the FC and Express teams. After starting off slowly and dropping the first game to the host team 2-1, they regrouped to win their next two matches and advance to the finals. The championship game was against a young, physical team with a couple of Virginia Tech players, but the Lions were just as physical and played like a true team, winning 4-2. This marks the second championship for the Lions at the annual Zico's tournament, the first being by the Masters in the over-30 division (several years ago). 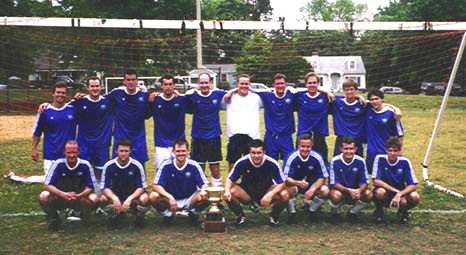 Fall 2000: Lions FC barely missed out on another Premier division championship, tied for first place but having lost head-to-head to Dublin. The newly formed Lions Express struggled through a tough season in Premier, while Lions United faced a similar situation in Division 1 as a result of the club restructuring. Lions Masters finished 3rd in Division 2. 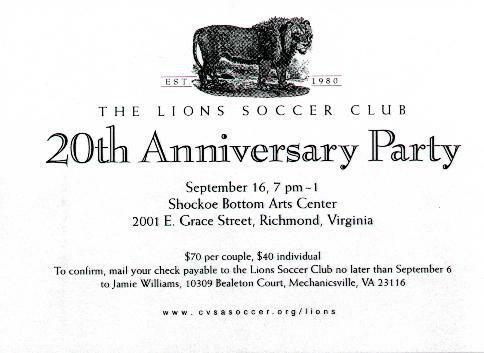 20th Anniversary Party (Sept. 2000): Members from all four Lions teams and almost as many alumni and club founders attended the catered affair at the Shockoe Bottom Arts Center. Of course Joao, Satch, Arthur Wu were there, but who expected to see Marcell or Peter Martin? Not to mention Terence and Jamie Jarman, but it's not like they ever really left town. With the 70's tunes rocking and the Lions Crest ice sculpture on display it turned out to be quite a memorable event. Summer 2000: The Lions entered four teams last summer, adding some young blood in the newly formed Lions Trinity team. Lions United and Masters both had impressive seasons, finishing second in their respective divisions (1st and 2nd) with only a single loss each. Lions FC and Trinity finished in the middle of the Premier division with 50-50 records. 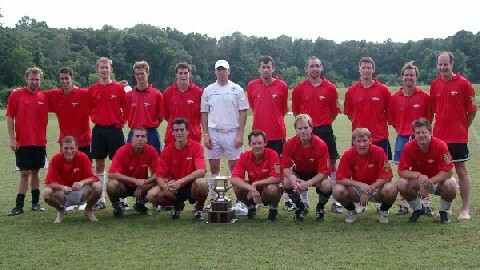 MDCVSA Challenge Cup Tournament (July 2000): The Lions Masters put forth a formidable team to win the annual statewide tournament at Bryan Park this year. With the outcome of two games decided in overtime in the two-day event, the Masters defeated three other CVSA teams to emerge victorious. For complete tournament results, visit the MDCVSA State & Challenge Cup website. Way to go Masters! 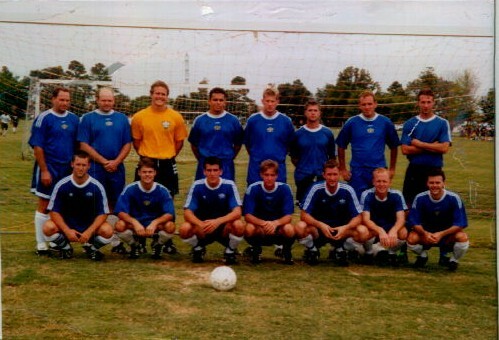 Charleston Low Country Soccer Tournament (Memorial Day Weekend 2000): Many new faces were invited to play for the Lions FC in the very competitive (16-team) Men's Division 1, as this was a rebuilding year for the young team. The Lions United was consolidated into a single team this year, and progressed as far as the finals in the Masters (over-30) Division 2, losing only to Greensboro IFC in their five games. The Lions Masters performed well in the Silver Masters (over-40) division, only to be knocked out by the eventual tournament champs, Moe's. For more information and complete tournament results, visit the Low Country Soccer website. William and Mary Seven-a-Side (May 2000): The Lions took two teams down to Williamsburg this year, with the Lions FC competing in both the A and B divisions. While the Lions United failed to make the playoffs in the B Division (despite a 2-1 record and a three-way tie for first place), the Lions FC were knocked out in the semifinal match as exhaustion from eight games took its toll on the players. Spring 2000: Lions FC finished up in the middle of the Premier division with a winning record, closing the season with a 1-0 shutout against Blackwatch. United finished in fourth place in Division 1, narrowly missing second place by a single goal in the final game. The Masters ended up in sixth place in Division 2. Fall 1999: The Lions Masters couldn’t quite hold on to second place in Division 2, while the FC and United finished in the middle of the Premier and 1st divisions. The biggest highlight was probably the Lions FallFest Cookout at Bryan Park, which has become a regular event each Spring and Fall. Summer 1999: The Lions only entered two teams this summer. And everyone had a good time at Wilbur’s deck party. 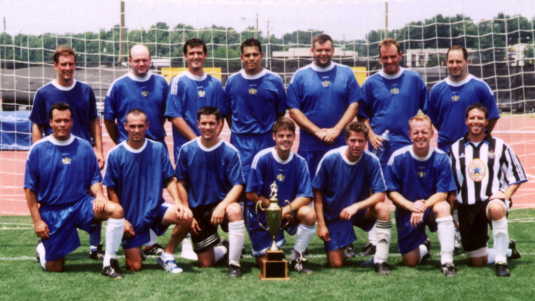 Spring 1999: Lions FC and United both finished in second place in Premier and Division 1, Masters finished in the middle of the newly formed (experimental) Masters division. 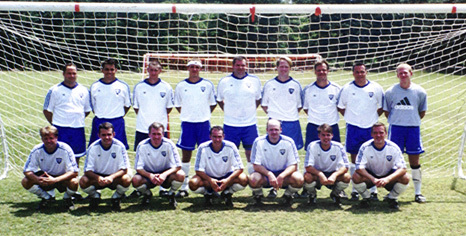 Charleston Low Country Soccer Tournament (Memorial Day Weekend 1999): The Lions FC faced some heavy competition in their first year in the Open division and did not advance past the preliminary round, ending their 3-year winning streak (in the Men's Division 1). Likewise the Lions Masters did not advance to the playoffs in the Silver Masters (over-40) division, finishing with a balanced record of 1-1-1. In the Masters (over-30) division, the Lions United struggled through 4 grueling matches against the other 3 teams in Division 1, including a repeat semi-final match (with the help of a few borrowed players from the Lions FC). The other over-30 Lions (Division 2) was the only Lions team to advance to the semifinals, losing to IFC Greensboro in what always seems to be an annual grudge match (also borrowing a few players from the Masters to help fill in some voids in the roster). Also, congratulations are in order for the ladies of the Richmond United team, advancing to the finals of the Women's Division 2, but narrowly losing to the Powerade team from Atlanta. William and Mary Seven-a-Side (May 1999): The Lions advanced to the semifinals on the astroturf in Division 1 of the annual tournament, after defeating the Fan Rats, but losing to the eventual tournament champs (the Spiders).